Groundcover plants, whether they're flowering or foliage plants - or even ferns - can help choke out weeds as they blanket the earth. 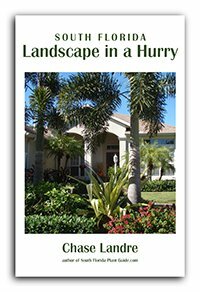 Once you've planted the palms, the foundation shrubs, the row of hedges, and the stately tree...the addition of one of South Florida's pretty groundcovers can put the finishing touch on even the most minimal landscaping. In fact, using the same groundcover in separate areas of the garden is a good way to pull together the design of your landscape. A fast-growing groundcover will fill in an area quickly or a more moderate or slow grower takes its time and won't get away from you...especially helpful in a smaller spot. 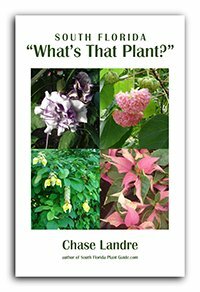 The Plant Pages will give you the growth rate of each one so you can make the right choice for your garden areas. 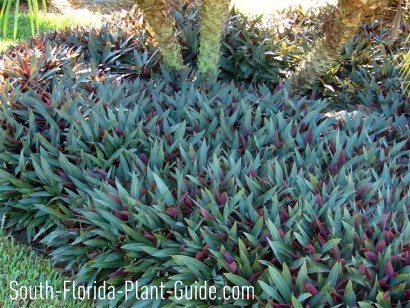 Some groundcovers actually climb if they're presented with a reason to do so - and can cover a wall or climb a tree trunk for an added bonus, a benefit you may or may not want. The Plant Pages will advise you on each one's habits so you can plan accordingly. A few - especially Perennial Peanut - work as a lawn replacement, though none like being walked on. In this case, use stepping stones in areas where you'll want to walk. If you're adding groundcover plants under trees, don't build up a bed of soil over the tree's roots. It basically "buries" the tree too deeply and it may suffer for it. Plants need surface roots to breathe and burying the trunk at a deeper level can cause it to rot. 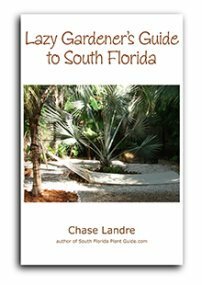 If you're planting a new tree (or palm, etc.) you can plan ahead for the bed by raising the tree's planting depth. Otherwise, plant right in the ground around the tree trunk. Smaller pots like 4" or 1 gallon size make it easier to dig holes among the existing roots in the soil and are less disturbing to the tree's root system. This can be a challenge. Their job, after all, is to cover the ground. Some will want to wander out into the lawn, across the walk or into other areas where you don't want them. Keep them contained by regularly edging the bed or by hand trimming the offending shoots now and then. Choosing the ideal one - and the right number of them to plant - keeps maintenance to a level you're prepared to handle. Most people don't think of ferns when they think of groundcovers...yet many fern varieties spread out nicely. They make perfect fillers for shady areas, and one - foxtail fern - grows in sun OR shade. Garden ferns can be used as foundation plants, a filler for garden beds that need a soft touch, or in a naturalized area of the yard that gets more shade than most plants like. Wide-spreading, low-growing plants like junipers also work as groundcovers, though to keep things simple we've included them in the Small Shrubs section. 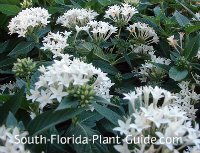 Several perennials such as lantana and blue daze grow low and wide and can be used to fill in an area. And annuals like petunias can blanket the ground for seasonal color (in winter). To figure out how many groundcover plants you need to fill in a planting area, measure the area in square feet. Example: a 10' X 6' area would be 60 square feet. Then decide how far apart you're going to plant the groundcovers...say 6" apart. Use the multipliers below to figure out how many plants you need. In our example, 60 square feet X 4 (the multiplier for 6" apart) = 240 plants. Sticker shock? You can decrease the number of plants to buy by increasing the plant spacing.